Why Joe and I Don’t Attend The Circus (Except Cirque Du Soleil). Everybody loves a circus, right? A harmless afternoon or evening of fun? Wrong. I don’t enjoy the circus and I really don’t think the animals that are forced to perform do either. And that is why Joe and I will not be attending the circus that will be in town in May. 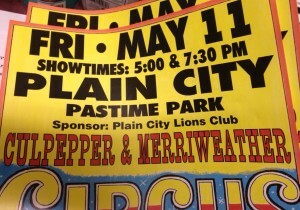 The Culpepper & Merriweather Circus is coming to Plain City on May 11 for two show times. The way this circus works is that they tend to pick smaller villages or towns to visit and get chambers of commerce or local schools (schools mean field trips and lots of children) and organizations to sponsor them. Then those groups sell the tickets for the circus in advance and receive a portion of the ticket sales. It is billed as a fundraiser. The circus moves from one small town to the next. On May 13, they will be in Johnstown. Many, many circuses are moving away from animal acts because the animals are made to perform using deprivation or punishment to enforce behavior. 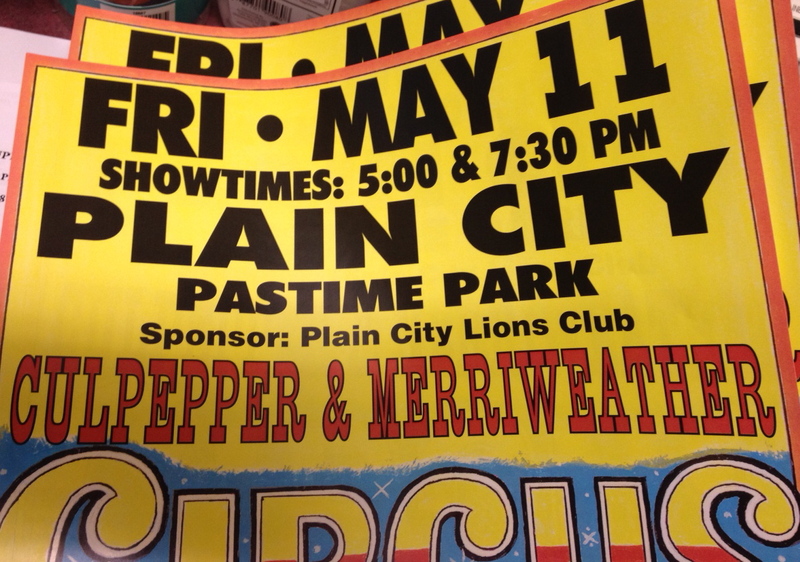 From the Culpepper and Merriweather web site, this circus uses a dog and pony show, trained birds, and camels. They do not mention having big cats, but on several other sites, I found evidence that they have performing tigers and lions. They no longer use elephants, as elephants are often the animals that lead to the most citations of cruelty for circuses and can produce the most risks if they escape–which two elephants did from this circus in 2008. Another elephant escaped in 2009 and was involved in a collision with an SUV. Going back to 1991, Culpepper and Merriweather has been in trouble with the U.S. Department of Agriculture (USDA) on numerous occasions for failing to meet the standards set forth in the Animal Welfare Act. You can read a fact sheet on these citations HERE. Read another opinion about this circus HERE. Tons of groups that promote animal welfare, including the ASPCA, ask that people not support an industry that harms animals. They ask those who care to NOT attend circuses that still use animal acts. Read the facts about animals in circuses HERE and HERE and HERE. 1. If you’ve ever taken dancing lessons or tried to balance on one leg for a long period of time, you know how hard those things can be. Now imagine you are a wild animal that never, ever would do those things in real life. How difficult do you think it is for an elephant or a lion to attempt those feats? The only way to get them to do it is with punishment. Would you really want to do something just because you were afraid–terrified someone would beat you or hurt you? 2. How would you like to be crammed in a tiny space for hours upon hours in a day, traveling from one town to another every week of the year? You’d get tired and so do the animals. When the animals finally are let out, it is to do embarrassing tricks that they don’t want to do. 3. What if you were deathly afraid of another type of animal (I don’t like snakes and there is no way I would work with a venomous snake each day of my life)? But, too bad. Every day, you are FORCED–yes, forced (no one gives these animals a choice), to work with another animal that could eat you. Often horses are trained to have lions ride on their backs. Horses are prey animals. Big cats are predators. It is against their natures to be together. You can imagine how terrified the horse is every time it is forced to allow that lion to get on its back–a position that would normally lead to the lion killing it. 4. These animals are majestic, awe inspiring creatures. They deserve our respect and our compassion. There are a number of circuses, including Cirque du Soleil (which I have attended), that do not use animals to entertain–only humans who chose that life. To see a list, go HERE. Please think about these things before you attend a circus with animals. 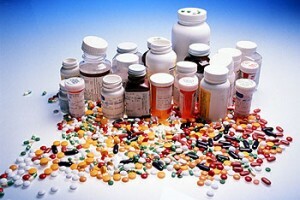 National Take-Back Day Allows For Disposal of Accumulated Medications on April 28. The National Prescription Drug Take-Back Day will take place on Saturday, April 28 from 10 am to 2 pm. During this yearly event, you can turn in old or no longer used medicines for proper disposal. We know that many of you may have medications that have expired or that you don’t take any more and this is a perfect way to make sure they are destroyed so that no one gets hurt. 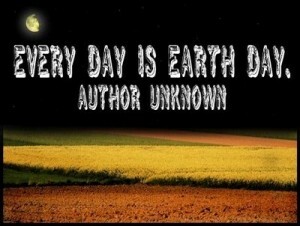 Celebrate Earth Day on Sunday, April 22. I had a professor in a geology class in college who said the very same thing, citing, as proof, housing developments named Maple Acres or Cherry Hill that lacked either of those types of trees. 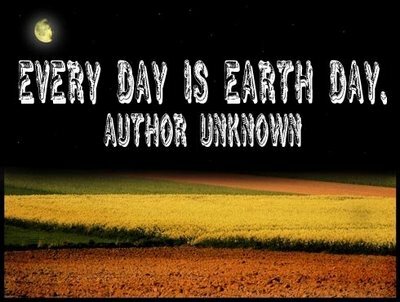 The very first Earth Day was celebrated forty-two years ago in 1970. Since that time, our Earth has grown ever more damaged and fragile. When I was little, one of my favorite pastimes was taking a walk, looking at the flowers and bugs and listening to the birds hailing each other above me. Everything was beautiful and exciting to me at that age. Even now, however, when I go out to fill the bird feeders on mornings awash in the pinks and silvers of daybreak, I am filled with awe and amazement at the beauty surrounding me in my own back yard. The maple tree feels like an old friend, sparrows and blue jays hanging from the branches. The pine trees form a living fence that smells delicious, the Christmasy scent intermixed with the moist fragrance of dew and grass. I cannot imagine these simple treasures disappearing. The Ohio Chapter of the Sierra Club will be celebrating Earth Day with an Earth Day River Clean Up at the Ohio State Wetlands Research Park on Saturday, April 21 from 10 am to noon. Volunteers will pick up trash and debris and plant native vegetation. Ohio State professor and wetland scientist, Dr. Bill Mitsch, will lead a bird tour at 9 am. For more information on this way to honor the Earth, go HERE. Green Columbus will celebrate their 6th Earth Day at a Columbus citywide event on Saturday, April 21, as well. Find out more about the celebration HERE. Grand Opening of Wise Brothers Sporting Goods, Saturday, April 21, at 10 am. On Saturday, April 21, Wise Brothers Sporting Goods will be holding a Grand Opening celebration at their location at 151 West Main Street in our happily expanding uptown area of Plain City. Mainstreet Treasures and the Plain City Historical Society will also be taking part in the festivities. At 10 am, the celebration will begin with the official ribbon cutting. All regularly priced merchandise will be discounted by 10% for the Grand Opening. Free balloons will be provided by Mainstreet Treasures. There will also be special sidewalk sale prices on assorted items. At 11 am, Pizza Villa will provide pizza for $.50 per slice. There will also be hot dogs and bottled water for $.25. Wise Brothers Sporting Goods will specialize in new and used sporting goods and equipment–both buying and selling. So take your old sports items in and with the money you get, buy new items in the store! Owners Duane and Kym Wise are happy to be part of the uptown Plain City business community and we are glad to see another business in our village. 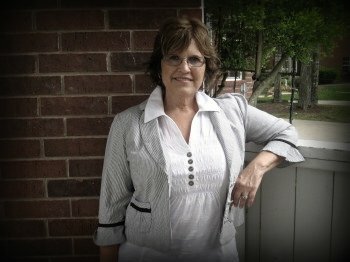 Author, Dianne Christner, Will Be at a Book Signing Event at Der Dutchman on April 21! Dianne Christner, author of the Plain City Bridesmaids series that is set here in Plain City, will be stopping in Plain City to promote the series’ first two books, Something Old and Something New. She will be available to sign books from 5 pm to 7:30 pm on Saturday, April 21, at Der Dutchman Restaurant and Carlisle Gifts. The third book in the series, Something Blue, will be available in August. You can read the blog postings I did previously about Something Old and Something New. I hope to stop by on Saturday to meet Dianne in person and have her sign the copy of the book she had sent to me. If you don’t have the first two books in the series, please visit Dianne on the twenty-first and purchase copies for her to autograph. Then prepare to slip into stories featuring people and situations that you’ll find very familiar from living in our little village. You’ll keep turning the pages as the characters become friends, weaving their way through places in Plain City that you’ll recognize as home.